For the past 6 months or so, the DRF has been at war. The Blue Donut War, so named by Jin’taan, expanded into a vast regional conflict. GOTG involved themselves and Fraternity proved their mettle on Tranquility. Fidelas Constans, a venerable alliance and staunch DRF ally, collapsed in the fighting. Triumvirate was pushed back by the united force of the DRF and TEST. That has all been covered at length. But while public consciousness moved on, the DRF has not. They are still at war. And they are losing. A shaky coalition of nullsec PVPers and wormholers has been savaging the DRF. Despite the arithmetical inconvenience of being outnumbered 35 to 1, Unspoken Alliance, Skill Urself and VOLTA have carved a bloody swathe over the Drone Regions. On the face of it, this does not seem remarkable. Every coalition takes losses of ratting and mining ships. But that is not the case here. Alongside the routine losses, the DRF is losing space. A coalition of over 35,000 pilots is failing in a conventional war against a loose group of 1000. EN24 sat down with 3TEARS, executor of Unspoken Alliance, to find out more. Where does Unspoken Alliance come from? We were born in southern Great Wildlands and fought the locals for a while. Eventually Nullsechnaya came back and we allied with them. All that turned into the Great Wildlands Conservation Society and we moved to north gw [Great Wildlands] on the Etherium Reach border. We stayed there for many months fighting for the moons against a group called bangarang, then hells pirates. Why the current fighting with the Drone Region Federation? Well it’s always been in the name of content, not wanting to deal with blue donuts (despite gw [Great Wildlands Conservation Society] being blue at the time) and getting fights. The thing with drf is that it’s not a single group so you can pick on each individual alliance and despite them trying to defend, they usually end up collapsing or evaccing within weeks When we were still in gwcs [Great Wildlands Conservation Society] we all deployed to ER [Etherium Reach] and got some good fights against b team around when darkness invaded. We left gwcs and stayed in ER while everyone went back. So Skill Urself and some others are also fighting the DRF – would you consider yourself formally allied? Currently we are pretty much formally allied. After the war, I doubt blue standings will continue but it just makes life easier than having to continuously re-temp blue every fight. So the fighting is mainly for content, but are there any wider political ambitions? Do you see the DRF as an overall entity collapsing? Over the duration of the fighting we have grown to realize how awful they are for the game. Blatant lying to line members, biggest coalition but has to pay everyone to help, and the rampant botting (prob rmt too but I can’t prove that one :p). So yes, we would love nothing more than to see DRF collapse. I think drone control unit are on the brink of collapsing. Their fleet numbers are so small anymore that even with horde they aren’t able to fight. Why do you think the DRF is faring so badly? I think it’s because the risk adverseness. They believe that since they outnumber so much that Feroxes and Svipuls will do the trick with no capital support. Unspoken and skill urself both use very high sp and high isk doctrines with capital support and I believe have much more skilled Fleet Commanders. Do you think Horde might be able to prop up the DRF going forwards? I’m not too sure. At least from what I’ve seen on Reddit horde line members doesn’t like helping DRF much. 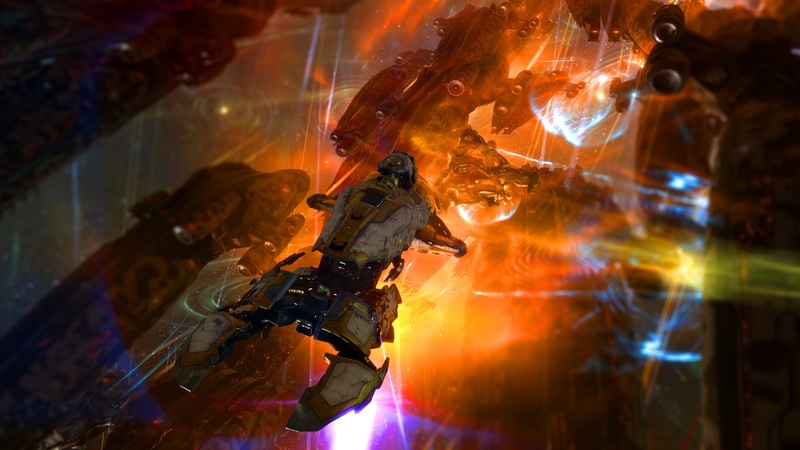 In the fight last night [28th of March] in Oasa, horde Svipuls were killing DRF entosis ships too. What would UA do if the DRF collapsed? We would just switch targets. We never want to be a power block like TRI is (was?). Our roots are a small gang pvp alliance, I like trusting each of my pilots on the battlefield and knowing their skill. [I] would hate to be too large to not know each person. Do you see a sustainable future for alliances which go against the grain of blue donut, as it were? I see one but people will need to understand that their space isn’t what gives them identity. It’s the fights they give. If you go against an enormous group like DRF, all it takes is pressure in the right points to make individual alliances collapse or leave. If the coalition ends up purging you, wait till they leave and try again. If it was a group like goons or test where it’s one large alliance, this would be impossible for a group of our size. We took advantage of the chaos of the tri war and it’s turned out pretty well. I hope other groups try similar things. I’ve heard frat nipping drf is just so they can build up their fleet as they gain skills and grow in order to start a war. Hope it’s true. The DRF is on the back foot, some might even say reeling, but it is by no means out of the fight. Unspoken Alliance and their allies are doing very well – but have yet to meet the full might of their enemy directly. Other parties, such as Iron Armada, are moving to the combat zone. The situation is likely to only escalate from here. EN24 will keep you updated with both news and commentary on this growing fire in the east. Someone essentially help to make significantly posts I might state. This is the first time I frequented your web page and so far? I surprised with the research you made to make this actual post extraordinary. Wonderful task! Great remarkable things here. I¡¦m very glad to peer your post. Thank you a lot and i’m taking a look ahead to touch you. Will you kindly drop me a e-mail? I enjoy you because of your own labor on this blog. Kate really loves making time for investigations and it’s simple to grasp why. My partner and i hear all concerning the dynamic mode you produce functional things on your web site and therefore increase response from visitors on that area while my simple princess is without question learning a whole lot. Take pleasure in the rest of the new year. You’re the one doing a splendid job. you’re actually a good webmaster. The website loading speed is incredible. It sort of feels that you are doing any unique trick. In addition, The contents are masterwork. you’ve performed a excellent activity on this topic! I’m trying to find garments and design ideas at an affordable costs for a lady over 25 … Anybody understand any type of good sites or blog sites?. Feels like everything I locate is either geared towards teenagers or is insanely costly couture … Thanks!. I was just seeking this info for some time. After six hours of continuous Googleing, at last I got it in your web site. I wonder what is the lack of Google strategy that do not rank this type of informative websites in top of the list. Generally the top websites are full of garbage. You completed several nice points there. I did a search on the subject matter and found a good number of persons will agree with your blog. iBngGs Somebody necessarily lend a hand to make critically posts I would state. wonderful post, very informative. I wonder why the other experts of this sector don’t realize this. You must proceed your writing. I am sure, you have a huge readers’ base already!